Companies, a group of friends, organizations, clubs and even families can get together for meetings every once in a while. It is when they talk about their current status, their plans for the future, or some issues that need to be addressed. Departments in companies may find a need to get together with other departments regularly if business demands it. It is strongly suggested that departments do not consider holding a meeting without initially creating a department meeting agenda because they are increasing the likelihood of failure. Regular meetings are essential for a company. The meeting will be between the heads of different departments within the company or may even include outsiders. It gives their employees a chance to gather and exchange information with colleagues as well as their respective superiors. Under the circumstances, the earlier the agenda is created, the better it would be for the organizers to be prepared and allow sufficient time even for the others to arrive for the meeting prepared as needed. For a meeting to be organized and productive, the presider should always make use of a meeting agenda to guide them on the topics that need to be taken up. Department meeting agendas are specifically meant for heads of department or even their subordinates which should be specified in the letter. Preparing an agenda ahead of time will give the participants a chance to prepare for the meeting and, at the same time, also give them an opportunity to contribute to the agenda by suggesting additional topics to be discussed. As these meetings are between different departments of a single company they are often considered as internal meetings unless the company decides to invite outsiders for any reason. 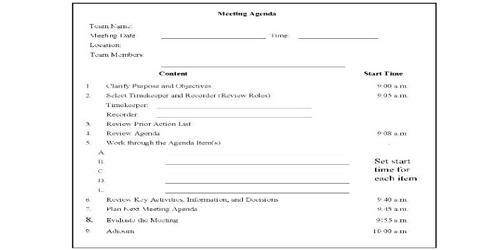 Department meeting agendas are usually created by employees of the particular department which has decided to organize the meeting with others. The departments calling for the meeting must be specific about the kind of discussions they intend to hold as well as make it clear the number of participants that are expected to attend. However, the agenda must be sent to the respective department from where the participants are expected to attend. Sending a department meeting agenda organized by the finance department to training is unlikely to be productive for the company. It can encourage the participants to give feedback to the meeting planner regarding the direction of the meeting and make necessary improvements for future meetings.